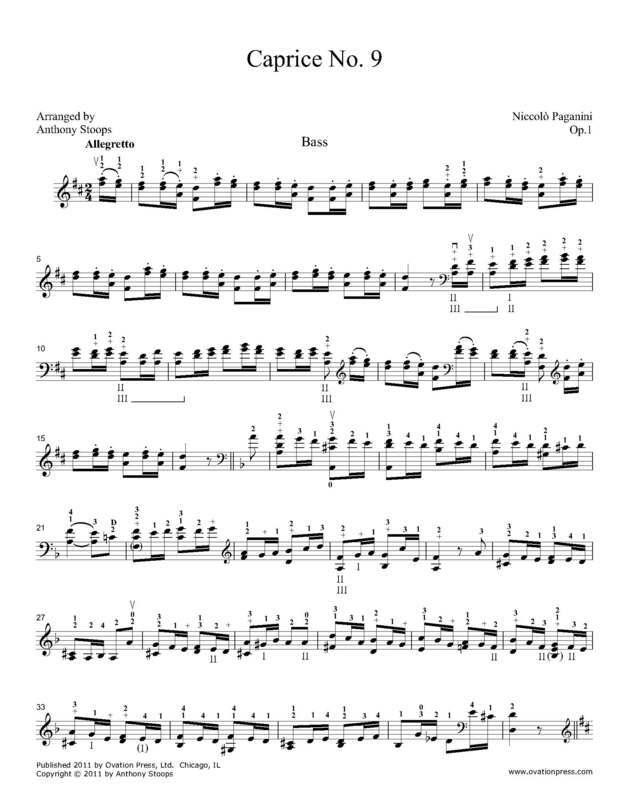 I transcribed Paganini's Caprice No. 9 to play for the 1995 International Society of Bassists Solo Competition because I needed a virtuoso work to round out my program. I was inspired to see if I could play Paganini on the bass after listening to Yo-Yo Ma’s recording of Kreisler and Paganini’s works transcribed for cello. I played my transcription for Diana Gannett who was my teacher at the time. I was having trouble with the octaves in the middle section and Dr. Gannett suggested a combination of thirds and sixths instead of octaves. This change implies octaves, yet it makes the passage playable from a technical perspective. The main piece of technical advice that I can give in learning this piece is to be economical with your bow usage – it will help keep all of the technical challenges under control.